WANNER INTERNATIONAL says Hydra-Cell pumps are increasingly being specified and retrofitted in pipeline sampling installations used for analysis during oil transfer - data that can be essential for identification or quality measurement purposes. Many systems operate 24/7 in remote locations so therefore pump reliability can be a fundamental requirement; reliability that many pumps fail to provide but Hydra-Cell pumps can offer. In many instances, pipe scale is the root cause of the problem. 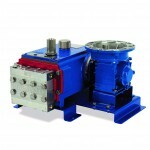 Hydra-Cell pumps are said to have multiple, hydraulically balanced diaphragms in a single pump head. They are seal-less and therefore leak free and can handle solid particles up to 1.5mm. The high pressure performance of these pumps ensures they are more than capable of meeting the pressure required to reintroduce the sampled oil back into the main flow.